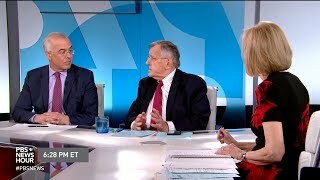 Shields and Brooks on the Mueller report and what happens next Syndicated columnist Mark Shields and New York Times columnist David Brooks join Judy Woodruff to analyze the impact of the Mueller report, with Rep.
Duluth, Minnesota (OpEdNews) March 31, 2019: My favorite scholar is the American Jesuit Renaissance specialist and cultural historian Walter J. Ong (1912-2003; Ph.D. in English, Harvard University, 1955), who taught English at Saint Louis University, the Jesuit university in St. Louis, Missouri. Ong's 400 or so publications include nine books published by prestigious university presses (two from Harvard University Press [1958a, 1958b], two from Yale University Press [1967, 1982], four from Cornell University Press [1971, 1977, 1981, and 2017], and one from the University of Toronto Press ). In addition, Ong published four books of essays about contemporary culture (Macmillan, 1957, 1959, 1962, and 1967). However, Ong published no political commentary. Now, the Canadian-born American author David Brooks (born in 1961) is a center-right political and cultural commentator. Since 2003, he has been an op-ed columnist at the New York Times, and he regularly appears with syndicated columnist Mark Shields (born in 1937) on the PBS News Hour of Fridays. Brooks published two books of satirical cultural commentary: (1) Bobos in Paradise: The New Upper Class and How They Got There (Simon & Schuster, 2000) and (2) On Paradise Drive: How We Live (and Always Have) in the Future Tense (Simon & Schuster, 2004). Then he tried his hand at writing a wee bit more seriously in two subsequent books: (1) The Social Animal: The Hidden Sources of Love, Character, and Achievement (Random House, 2011) and (2) The Road to Character (Random House, 2015). At first blush, it seems like discussing Ong and Brooks would be an exercise in comparing and contrasting apples and oranges. After all, unlike Brooks, Ong published no political commentary. Unlike Brooks, Ong does not use satirical cultural commentary in his publications about contemporary culture. Conversely, unlike Ong, Brooks has not published any serious scholarly books with prestigious university presses. Brooks says, "The Sabbath, he [Heschel] continues, is not a rest from the other six days. It is the peak experience the other six days point toward. On this day the Orthodox do less and in slowness can glimpse the seeds of eternity." Brooks quotes Heschel as saying, "'The seventh day is a palace [i.e., a physical structure in space] in time which we build. It is made of soul, which glides into our thoughts with a healing sympathy. It is a day on which hours do not oust one another. It is a day that can soothe all sadness away. No one, even the unlearned, crude man [or woman], can remain insensitive to its beauty.'" Now, in Ong's mature work, from the early 1950s onward, he characteristically works with the time/space contrast. However, as far as I know, Ong does not refer to Heschel's 1951 book The Sabbath in any of his 400 or so publications. As Ong operationally defines and explains the space dimension of the time/space contrast, the sense of space that he is referring to emerges in Western culture with the philosophy of Plato and Aristotle and continues through medieval Christian theology. However, with the emergence of the Gutenberg printing press in the mid-1450s, the sense of space eventually became far more pervasive and dominant in Western cultural history.